You don't need to put up with bunion pain any longer. Call us today on (03) 9457 2336 or book online and let us get you back on your feet. Have you developed a painful lump at the base of your big toe since wearing new shoes? Although not the only cause of bunions, it is a well established fact that the shoes we wear in the Western world are one of the major causes of bunions. Did you know that bunions effect around 30% of the population in Western countries, but only effect 3% of the population in Eastern countries? The reason for this significant difference is the shoes we wear in Western countries such as high heels or trendy loafers or boots that have a narrow toe box. Women in particular are impacted by bunions from high heels - due to the design of these shoes, the weight of the body is carried by the ball of the foot (which causes it to expand outward), while at the same time the toes are force inwards into a narrow toe box. The result is a painful bunion developing on the outside of the foot at the base of your big toe, ouch! As with all treatments for foot health concerns, accurate diagnosis of the root cause is crucial to the success of your recovery from bunions. Our skilled and experienced Podiatrists will spend adequate time speaking to you about your footwear, your family history, any past injuries you may have and conducting a thorough biomechanical analysis of your walking style. Address any swelling, inflammation and pain relief: A range of options are available to reduce the pain and swelling of your bunion such as taping, icing, massage and removing the pressure off the bunion - it is important to address this issue first so effective and lasting treatment can then take place. Restore healthy function and movement: Once the bunion swelling and pain has been sufficiently reduced, it is important to mobilise the toes again back to healthy and normal function. Joint mobilisation and alignment exercises will be tailored for your specific situation to achieve this outcome. Muscle and ligament strengthening exercises: As correct movement is restored, the focus shifts to strengthening the toes so they can continue to hold the correct movements long term when they are used throughout your daily activities. This treatment may also include the use of a bunion night splint to help train and strengthen your toe to maintain the correct position overnight. 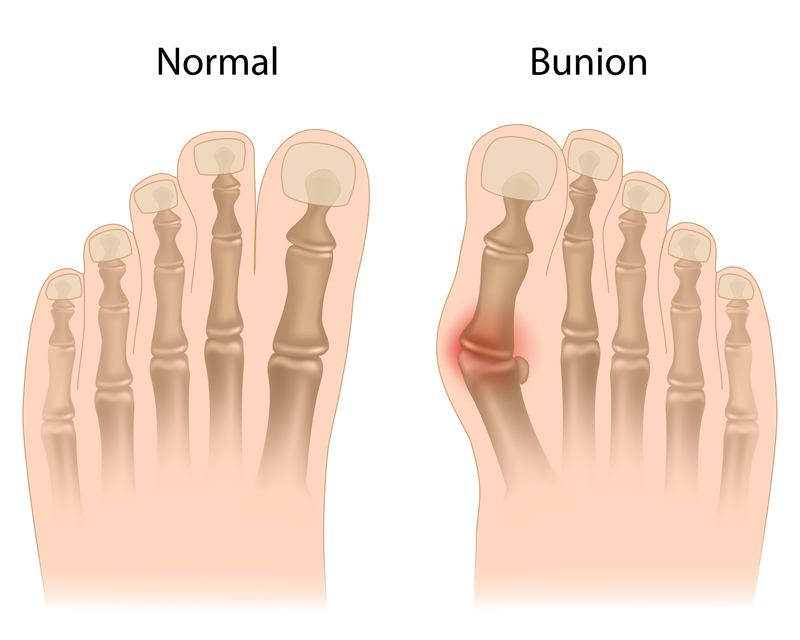 Embed behaviours to prevent bunion returning: Even with your toes and feet being restored to healthy function, care must be taken to ensure the bunion does not return. Depending on your situation, this may involve only wearing your favourite high heels for a limited time, wearing shoes with a wider toe box and / or continuing on with a light exercise routine for your feet and toes to ensure muscle strength and correct movement is maintained. The longer you ignore a Bunion, the worse it will get over time. If you think you have a Bunion forming it makes sense to get it looked at as soon as possible - remember that the earlier you catch it, the shorter the treatment required to return your feet back to normal. You don't need to put up with Bunion pain any longer. Call us today on (03) 9457 2336 or book online and let us get you back on your feet pain free and walking with confidence once again.